If you enjoyed "Donnie Brascoe" in either the movie or book form, then you will love this book. This is the true story of a guy who goes so deep undercover within the Mob that he actually becomes proposed for membership. A "made" man. Juggling several cases at once and playing various roles would seem more suited to a Hollywood Actor than to a typical FBI Agent. 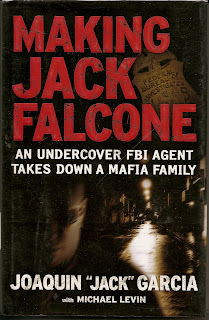 But Jack Falcone is not your typical agent,as you will see when you read this book. A veritable giant of a man physically, at 6"4" and weighing at times over 400 pounds, he must find his emotional and mental strengths to endure the complexities of the assignments he undertakes. At times he is forced to fight the beauracracy of his own FBI in order to fulfill the requirements of "taking down" the real criminals to which he has been assigned. The futility of having his case "shut down" inexplicably by his superiors takes a toll on the sensibilities of the reader. You can actually feel the disappointment of Agent Falcone after so many years of working this case to it's apex. From the streets of Philadelphia to the nightclubs of Miami, this is one of those fast paced, page turning reads which has left me wondering why I bother to write of my own experiences. They pale by comparison.